Want to backup your new iPhone without using iTunes on computer? Read this post now to get basic tip about how to backup iPhone 6/6s to iCloud. Backup your iPhone 6/6s by using AnyTrans to transfer 20+ types of files from your iPhone to your computer after reading this how-to tutorial. iCloud offers several services (including iCloud Backup, iCloud Drive, iCloud.com and iCloud Music Library) to help you sync, share and backup data on your device. If you are one of new Apple users that got iPhone 6 or iPhone 6s recently, for protecting the data on your iPhone, you’d better know something about how to use iCloud to backup your device, which is a good way to backup your iOS 8/9 devices without using computer and iTunes. In this post, we offer you the basic tip about what types of data on your iPhone 6/6s iCloud will back up and how to backup iPhone 6/6s to iCloud. iTunes purchased history/lists on iTunes Store, App Store and iBooks Store. Setting information of your iPhone. You can easily backup your iPhone 6 or 6s to iCloud if you own one Apple ID and have your device connected to a stable Wi-Fi network. You are suggested to connect iPhone to a power source in case of iPhone auto power off because of taking too long to backup. Step 1. Unlock your iPhone, Go to Setting > iCloud. Step 2. 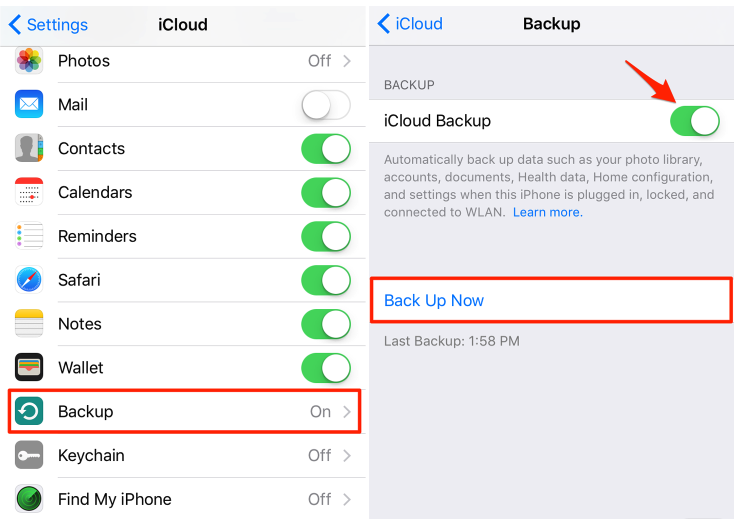 After logging into iCloud by using Apple ID, tap Backup, You can choose one method from two - automatically backup your iPhone 6/6s and manually back up. iCloud is absolutely useful to backup your iPhone 6/6s without one computer, however, this service is not perfect – slow backup-speed, limited free space and some other iCloud problems may stop you using it. In this case, you can try some other tools, such as iTunes and AnyTrans.